Tomorrow (March 07th, 2017) the birthday cycle of TLC opens the doors to public. Yes, TLC is celebrating it's 4th Anniversary with this huge round ! 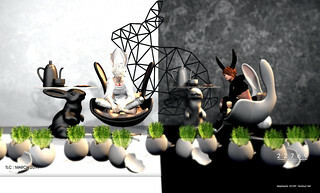 22769 has created for this special occassion the BunBun Set in white and black for you to choose from. Completed are the set by the free Egg Planter. Please keep in mind that the venue is currently closed for setup, but will be open to public an March 7th, 2017.